【NON-ITCHY SILICONE COATED FIBERGLASS】- Avoid the splinters and irritation that comes with other fire Resistant bag. We use a silicone coated fiberglass to give you superior Use experience without the irritation you get from other bags.  【Zipper and Velcro CLOSURE FOR MAXIMUM FIRE PROTECTION】-Those that use only velcro fixed fireproof bag, which may allow fire to creep in, We made further optimization and added a zipper closure plus velcro for double the protection. 【Large Capacity & Portable】 Size: (15\'\'x11\'\'x3\'\'), Perfect to hold quite a bit of documents, including passports, birth certificates, Cash, jewelry，legal contracts, photos, real estate deeds, currency, battery, tablet and other valuables, even laptop. The fireproof money bag is foldable and portable, just put in a kitchen drawer or small safes. With shoulder strape, can be used in home, office and on Business. 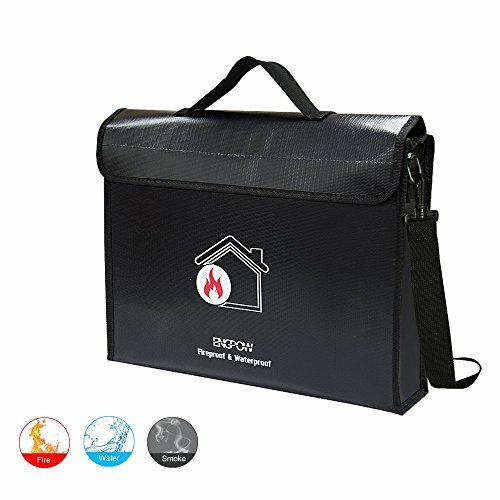  【Your Safe New Year Gift】Made of silicon coated fiberglass with heat blocking aluminum foil inside, our fireproof bag will resist the heat from flames up to 1100°F. our fireproof envelope is also highly water resistant to keep your items safe no matter what.  【AFTER SALES SERVICE】: RUBUN promise to give you best friendly customer service and 1 year warranty service.Any further problems with your items, please feel free to contact us.